Notwithstanding a humiliating defeat for the ruling party in Hisar, several are in race for the Congress ticket for the impending byelection to the Ratia Assembly seat. The bypoll has been necessitated due to the death of INLD MLA Gian Chand Odh due to brain hemorrhage on September 12. The Health Department, Haryana, has decided to launch an anti-measles vaccination campaign in the state from November 14 to December 5. This was stated by state Health Minister Rao Narender Singh while interacting with residents at the Canal Rest House here recently. INLD supremo and former Chief Minister Om Prakash Chautala has said both the Congress-led UPA government at the Centre and the Hooda government in Haryana are in a state of fragility and mid-term elections in the country as well as the state can take place anytime. He stated this while addressing a meeting of the party activists here recently. A state-wide campaign will soon be launched by the Haryana Health Department to motivate the people to adopt small family norms so as to curb the rising population. The campaign will be launched from Jhajjar and it would continue up to the end of current financial year. The outgoing Gurgaon Commissioner of Police SS Deswal and Joint Commissioner of Police Alok Mittal have expressed gratitude to the local administrative officers, mediapersons and general public for their support and co-operation in maintaining a secure environment in the district. Yamuna Group of Institutions, Gadholi, got 24th rank in the College Survey Report (CSR) of Global Human Resource Development Centre (GHRDC) - Ranking of Promising Top B - School Survey. Dr Sarvjeet Kaur, director, Yamuna Group of Institutions, said there were about 3,000 B-schools in India. Chaman Vatika School celebrated its annual day and prize distribution ceremony here recently. Principal Secretary to the Chief Minister Dr KK Khandelwal was the chief guest and Ambala DC Sameer Pal Srow was the guest of honour. The authorities have decided to take up the work of registering new beneficiaries for the social security pensions in the district from November 2 to November 30. Senior citizens, widows, destitute women, differently-abled persons and orphans could apply for the social security pensions during this period. 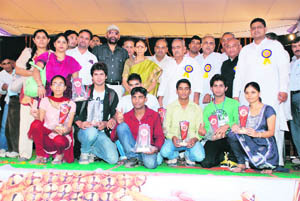 The Agarwal Vaish Samaj (AVS), a socio-political organisation of the Vaish community in Haryana, has announced its 2nd Annual Vaish Samman - 2011 Awards for meritorious Vaish achievers in various fields. Reiterating her commitment to save the girl child and bring an end to female foeticide, Karnal Deputy Commissioner Neelam Pradeep Kasani shifted the focus of cultural extravaganza “Jhankar-2011” of Navodaya Schools of northern states to foeticide by making a sketch of a girl and inscribing “let the girl child take birth” on it. The National Centre for Disease Control, Directorate General of Health Services, Union Ministry of Health & Family Welfare, has recognised the local National Research Centre on Equines (NRCE) as the national diagnostic and reference laboratory for diagnosis of glanders in humans. Dr RK Singh, director, NRCE, said the NRCE laboratory was already carrying out tests for diagnosing glanders in equines as per the OIE standards. Dina Nath Arora, president of the District Consumer Forum, ordered a Hyundai Car dealer of Jagadhari and Hyundai Motors to refund the original amount of Rs 3,45,718 and Rs 50,000 as compensation to the complainant. Activists of the Jangir Brahmin Sabha (JBS) from Bawal, Rewari, Narnaul, Mahendergarh, Gurgaon, Rohtak and several other places participated in the Vishvakarma Jayanti Mahotsav held at Bawal, 14 km from Rewari, recently. While noted JBS stalwart Satish Kumar was the chief guest, social activist Giasi Ram presided over its proceedings. Cartoid artery stenting has been the most efficacious and safe treatment and ensured minimum surgical invasion with faster recovery of the patient. This was stated by Dr Vipul Gupta, head of the Neurovascular Interventions, Institute of Neurosciences, Medanta the Medicity, Gurgaon. Distinguished youths from various parts of Haryana and Uttar Pradesh participated in a samman samaroh held for them at Lakarpur village in Faridabad district recently. Avtar Singh Bhadana, Congress MP from Faridabad, was the chief guest of the function. To honour meritorious students of the Scheduled Castes, a district-level Pratibha Samman Samaroh was held under the auspices of Dr Bhimrao Ambedkar Social Welfare Association in the Hem Chander Vikramaditya Hall here recently. In view of the rising graph of crime in the district, V. Kamaraja, Inspector General of Police (IGP) of the Rohtak Police Range, convened an urgent meeting of the district police officers at the Canal Rest House here recently and reprimanded them for failing in checking the crime. Mitesh Jain, SP, Yamunanagar, inaugurated the 34th Zonal Youth Festival by lighting the lamp here recently in the auditorium of Hindu Girls College, Jagadhari. Dr Ujjwal Sharma, principal of the college, welcomed the chief guest. The chief guest in his inaugural address congratulated the college team for organising the festival with zeal. A research paper entitled “tensile strength of sandstone under unconfined and confined conditions” jointly authored by Dr DK Soni, Dr Ashwani Jain and Prof RK Bansal of the Civil Engineering Department of the National Institute of Technology (NIT), Kurukshetra, has been published in the Journal of Rock Mechanics and Tunnelling Technology (JRMTT). The Krishi Vigyan Kendra (KVK) of the National Dairy Research Institute (NDRI) has advised farmers to procure the recommended and certified wheat seeds and timely sow these for attaining higher production during the Rabi season. 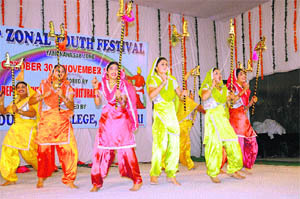 Indira Gandhi National College, Ladwa (Dhanora), organised Festival Celebration Competitions i.e. mehndi, rangoli and diya decoration on its premises, 20 km from here, recently. These competitions were organised under the supervision of Dr Madhu Gupta, HOD, Home Science, and Harneet Kaur, in charge, Women Development Cell. Motivation, commitment and effective communication are the keys to success in career and social life. Human values and etiquettes endear you among colleagues, friends and relatives. The corporate employer is very choosy and prefers those who are rich in soft skills and emotional intelligence. In order to encourage youth to participate in the political process, Guru Nanak Girls College, Santpura, Yamunanagar, organised a slogan writing and poster-making competition for the celebration of ensuing National Voters Day. 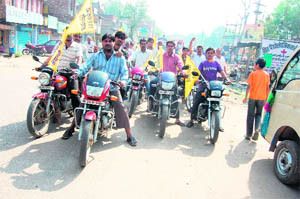 According to indications, the election will be held, along with the Adampur seat, in February next year. Though there are ticket seekers in all major political parties, the list of those in race for the Congress ticket is the longest. Former MLA Jarnail Singh, who lost to Odh in the general elections held in October 2009 by a margin of 3,382 votes, is again being considered a front-runner for the Congress ticket. However, two-time MP and former MLA from Ellenabad Sushil Indora, former MP Atma Singh Gill’s son Gurdeep Singh Gill, former minister Ram Swaroop Rama, former Zila Parishad vice-chairperson Mandeep Kaur Gill, Jagdish Mistri and Laxman Dass Napa are a few other contenders who have been leaving no stone unturned to stake their respective claims for the ticket. Much will depend on the personal preference of Chief Minister Bhupinder Singh Hooda and Sirsa MP Ashok Tanwar, under whose parliamentary constituency the Ratia seat falls. The INLD will be contesting the bypoll to keep intact the seat fallen vacant due to the death of its MLA. During a meeting of the party workers at Fatehabad recently, INLD Supremo Om Parkash Chautala announced that the party would be the first to announce its candidate once the notification for the bypoll was issued. According to sources in the party, the INLD is likely to field someone from Gian Chand Odh’s family in order to cash in on the sympathy factor. Apart from the sympathy factor, this can fit in the caste equations of the party as it did in the general elections. Sources in the HJC-BJP combine indicate that the Ratia seat is likely to go to the BJP, as Kuldeep Bishnoi’s party will contest the Adampur seat. In this case, Mahabir Prashad, son of former MLA Pir Chand, is considered the strongest contender for the party ticket. Mahabir Prashad has contested the Ratia seat as well as the Sirsa parliamentary seat in the past. The party has given indications that the seat is likely to come to its fold in the HJC-BJP combine, as it changed senior BJP leader LK Advani’s yatra programme at the last minute to include a rally at Fatehabad on November 12. Earlier, the BJP had planned to hold a reception on the route only, but now the party has planned a rally, ostensibly to derive political mileage out of it in view of the bypoll. Prashad along with BJP’s Kisan Morcha president Subhash Barala and former minister Shashi Pal Mehta will be conveners of the yatra programmes at Fatehabad. However, if the seat is contested by the HJC, Mangat Ram Lalwas, who contested the last Assembly poll, can be repeated by the party. The minister said all the children of the state in the age group of 9 months to 10 years would be administered anti-measles vaccines during the drive. During the first week of the campaign, the children in the target group would be vaccinated at schools and during the next two weeks, those children who do not go to schools or the left-out children would be vaccinated at selected places in their towns or villages. The minister appealed to the parents/guardians of the children to get them vaccinated during the campaign. Meanwhile, Haryana Cooperation Minister Satpal Sangwan said the vacant posts in various government departments would soon be filled up so as to provide employment to the unemployed youth and dispose of the pending works in the departments. Addressing the people at the Canal Rest House here, Sangwan asserted that no stone would be left unturned in ensuring holistic development of southern Haryana, particularly of the Charkhi Dadri and the Narnaul areas. He exhorted the workers to remain prepared for a snap poll even at a 24-hour notice and took a dig at the decimation of the Congress in the recent Hisar bypoll. Lamenting the BJP’s “injudicious alignment” with HJC chief Kuldeep Bishnoi, the INLD chief said in spite of their defeat by a small margin, the INLD had gained such strength which was proving a nightmare for the Congress activists. Launching a scathing attack on the Hooda regime for its lopsided policies leading to the state’s financial bankruptcy, he said while the debts here had touched a new high of Rs 52,700 crore, every new-born child in the state was coming into being with a hefty debt of Rs 36,000 on its head. Stating that the Hooda government was releasing advertisements to raise loans even for the repayment of huge interest on these massive debts, he said while the government was not in a position to disburse salaries to its employees, even timely distribution of pension to senior citizens was facing hiccups. Those who attended the meeting included party legislators Rameshwar Dayal (Bawal) and Rao Bahadur Singh (Nangal Chaudhary), district party chief Sunil Chaudhary, district president of the Mahila Wing of the party Kamla Sharma and state executive committee member Satish Yadav. While stating this here recently, a spokesperson for the Health Department said all civil surgeons in the state had been directed to set family planning targets for all health officials so that rising population could be checked effectively. The male multipurpose health workers and female multipurpose health workers would have to motivate at least 15 men and 10 women, respectively, to undergo sterilization operations. However, the target of at least 20 women had been set for ANM (Urban RCH). Similarly, each ASHA worker and staff nurse would have to motivate at least two women to adopt the norms of family planning, whereas the target of at least one case had been set for Anganwadi worker. The cooperation of other departments like, the Panchayati Raj and the Women and Child Development has been sought for the success of the campaign, he added. He said under the campaign, which was based on information, education and communication, pregnant women would be motivated for institutional deliveries. Haryana had been included in the list of 11 sensitive states in the matter of family planning and population control, as the total fertility rate in state had reached up to 2.5 per cent. This was the reason that a need was felt to popularise the norms of family planning in the state. The Health Department had prepared an action plan to conduct this campaign successfully. Deswal, who joined as the Police Commissioner of Gurgaon in February 2009, has now been shifted to Chandigarh as the Additional Director-General of Police (CID), Haryana. On the other hand, Mittal has been given the assignment of Inspector-General of Police (IGP), Rohtak range. At an informal farewell ceremony organised at the Police Commissioner’s office here recently, Deswal and Mittal shared their experiences with mediapersons and extended their good wishes to them. Deswal observed that though the media had reported the incidents of crime in a responsible way, more restraint should be exercised in reporting the happenings and issues which might have an adverse impact on society. “Mediapersons are also the residents of the city and, therefore, have a double responsibility…they should take care that their reports should neither tarnish the image of the city nor create panic among the residents,” he said. He said because of the high literacy rate and awareness, people in big cities like Gurgaon have high expectations from the media as well as administration due to which both remain under pressure to deliver. The Commissioner said he was always in favour of educating the people to make them understand the benefits of obeying traffic rules while on road. “Traffic management and lowering the number of road accidents have always been my priority and a number of drives were launched to spread awareness on the vital significance of obeying traffic rules,” he stated. 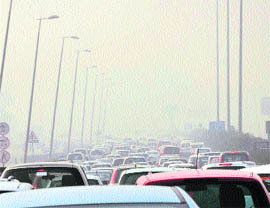 Deswal asserted that more police personnel were required in Gurgaon for efficient traffic management. He opined that the companies having operations in the city should fulfil their corporate social responsibility and help in beautification of the city. Yamuna Group of Institutions, Gadholi, got 24th rank in the College Survey Report (CSR) of Global Human Resource Development Centre (GHRDC) - Ranking of Promising Top B - School Survey. Dr Sarvjeet Kaur, director, Yamuna Group of Institutions, said there were about 3,000 B-schools in India. Out of 400 B-schools shortlisted, approximately 250 B-schools responded for participation and finally 169 B-schools were selected to participate. 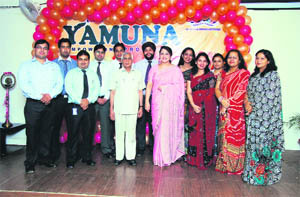 Out of the 169 top B-schools, the Yamuna Group got 24th rank. This was really a moment of proud for the entire institution, she said. The research agency set 160 marks for infrastructure, 455 for faculty, 320 for admissions and 465 for placement, social responsibility and industry interface and Yamuna Group scored 618 marks and the institute on 1st position scored 697 marks, sources said. The CSR-GHRDC B-school survey is based on primary data which the GHRDC collected directly from every participating institute, duly verified through rigorous process of visits to the institutes, e-mails, calling on phone, supplementary questions etc. According to the sources, there were different parameters which were identified for ranking including infrastructure, faculty, research and consultancy, management development programme, admission, curriculum and delivery system, placement, industry interface and involvement in social projects in collaboration with the national and foreign universities. Each parameter was then further divided into a number of sub-parameters for a more rigorous quantitative and qualitative analysis and assessment like infrastructure was sub-divided into physical and academic infrastructure and included sub-parameters like built-up area, hostel on campus, auditorium, classroom, library, teaching aids, number of LCDs etc. Chairman of the group Rajinder Singh and director-general of the group Dr SR Mehndiratta congratulated Dr Sarvjeet Kaur and the whole team of management for the achievement. On the occasion, the students presented a medley of songs and also paid tributes to the Bollywood actor, late Shammi Kapoor, by playing his songs. Khandelwal appreciated the efforts of the students, staff and the management of the school. He said schools played an important role in the overall development of a child. He asked the students to work hard to achieve their goal, adding that they could achieve their target by paying regards to their teachers and parents. He said there were a number of opportunities available in the state for higher and professional education. Principal of the school Michael D’souza threw light on the achievements of the school in his annual report. He said the school not only offered the best in academics but also helped in the overall development of the students through various co-curricular activities. As many 70 merit holders and 257 students, who had excelled in various fields throughout the year, were honoured at the function. Deputy Commissioner Yudhbir Singh Khyalia said those aspiring to get their names included in the lists could apply with the copies of their voter identity cards and proof of their age. “Those who do not have a proof of their age will have to get their age assessed from a committee of two doctors constituted for the purpose at the community health centre (CHC) level,” he said. Women seeking widow pension would have to produce the death certificate of their husband, the DC said. The application forms would be accepted in the offices of the block division and panchayat officials at Sirsa, Ellenabad, Rania, Dabwali, Baragura, Odan and Nathusari Chopta for the rural areas and in the office of executive officer, Municipal Council, Sirsa, for the urban population of Sirsa town. For people living in the urban areas of Rania, Ellenabad, Dabwali and Kalanwali, the application forms will be accepted in the offices of secretaries of the respective municipal committees. Durga Dutt Goyal, spokesperson of the AVS, said while the first award would be given to a student from the community who had secured the top position in the senior secondary examination at the state level this year, the second award would be given to a Vaish sportsperson who had participated in an international sports competition. He added that a distinguished medical practitioner from the community would receive the third prize. Applications of aspiring candidates should be sent to the convener of the selection committee by November 15, he said. The spokesman said the AVS chief Ashok Buwaniwala had constituted a five-member selection committee for the purpose, adding that the awards would be given to the achievers at a state-level sammelan of the community at Kaithal on December 4. The Deputy Commissioner, who reached Sagga village to inaugurate the cultural function of 65 Jawahar Navodaya Vidyalaya of the Jaipur zone comprising Haryana, Delhi and Rajasthan, went around a paintings exhibition organised by Navodaya Schools and penned her message to stop the menace. She lauded the efforts of the students and said paintings and sketches were a powerful medium for spreading social messages. She also urged the people, especially the students, to fight against social evils. Such cultural exchanges afforded an opportunity to students from different parts of the country with different culture and background to understand each other better and strengthened national integration, she added. The National Centre for Disease Control, Directorate General of Health Services, Union Ministry of Health & Family Welfare, has recognised the local National Research Centre on Equines (NRCE) as the national diagnostic and reference laboratory for diagnosis of glanders in humans. Dr RK Singh, director, NRCE, said the NRCE laboratory was already carrying out tests for diagnosing glanders in equines as per the OIE standards. The decision for recognising the NRCE laboratory for diagnosing the disease in humans was taken in the standing committee meeting of the NCDC. In view of the services rendered by the NRCE for disease diagnosis, it has already been recognised as the national reference laboratory for the diagnosis of equine infectious anaemia, equine influenza, equine rninopneumonitis, equine piroplasmosis, contagious equine metritis, equine viral arteritis, salmonella abortus equi infection, dourine, glanders, trypanosomosis by the Union Ministry of Agriculture. 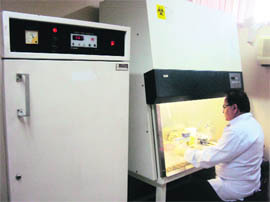 The lab will be looked after by Dr SK Khurana, senior scientist of the NRCE. Gunjan G Khurana, a resident of Jagadhri, had filed a complaint with the District Consumer Forum, Yamunanagar, against M/s Khanna Car Plaza Pvt Ltd and others alleging that she had purchased a Hyundai Santro XL Car on August 31, 2006, against the cash payment of Rs 3,45,718 from Khanna Car Palza, Jagadhari, regarding some manufacturing defect. Her complaint filed on July 21, 2007, stated that there was some manufacturing defect in the steering and the vehicle showed low pickup. But the defect could not be removed. Again on May 11, 2008, the customer reported a problem in the power steering. However, after the company engineers checked the vehicle thoroughly, complete power steering and gear assembly was replaced free of cost, being under warranty by Khanna Car Plaza, but the defects could not be removed. Again on August 29, 2008, the complainant brought the defects of the vehicle to the notice of Khanna Car Plaza, such as poor mileage, poor pickup and power steering. The vehicle was duly attended and all reported defects were duly rectified as per the company representative. After hearing both parties, the president of the forum and members Dr VK Sharma and Urmil Beniwal ordered that M/s Khanna Car Plaza Jagadhri and M/s Hundai Motors India Ltd Chennai would pay the cost of the car amounting to Rs 3,45,718 to the complainant, along with the compensation of Rs 50,000. Both the respondents were also directed to pay Rs 5,000 as cost of proceedings within one month, failing which the complainant is entitled to 9 per cent interest per annum on the price of the vehicle from the date of filing the complaint till its realisation. However, Khurana would handover the vehicle in question to M/s Khanna Car Plaza or to M/s Hyundai Motors India Ltd, the order stated. Activists of the Jangir Brahmin Sabha (JBS) from Bawal, Rewari, Narnaul, Mahendergarh, Gurgaon, Rohtak and several other places participated in the Vishvakarma Jayanti Mahotsav held at Bawal, 14 km from Rewari, recently. While noted JBS stalwart Satish Kumar was the chief guest, social activist Giasi Ram presided over its proceedings. Dr RK Jangra, national president of the All-India Jangir Brahmin Yuva Mahasabha, who was a distinguished guest, flagged off the Lord Vishvakarma Shobha Yatra. Delivering his keynote address, Dr Jangra lamented that while the Jangir Brahmin Samaj, with the blessings of its celestial progenitor Lord Vishvakarma, had significantly contributed to India’s spectacular progress in the post-Independence era, the Samaj had failed to gain due representation in the country’s political hierarchy which it deserved. Making a mention of his recent communication sent to Prime Minister Manmohan Singh, UPA Chairperson Sonia Gandhi and Union Railway Minister Dinesh Trivedi, Dr Jangra reiterated the Sabha’s long-standing demands of naming a technical university, a warship and an express train after Lord Vishvakarma. While chief guest Satish Kumar honoured 24 meritorious students of the JBS, its Bawal unit president Mange Ram thanked the guests and others. Students get opportunities to show their talent and a feeling of healthy competition is developed when they participate in youth festivals. Such cultural activities inspire new energy in addition to discipline among them. This was stated by Shiv Raman Gaur, Aditional Principal Secretary and Director, Information, Public Relations and Cultural Affairs Department, Haryana, after inaugurating a three-day Zonal Youth Festival sponsored by the Department of Youth and Cultural Affairs, Kurukshetra University, and hosted by Bhagwan Parshu Ram College here recently. Calling upon the technical education institutions, Gaur said they should include such technical courses to their syllabi which could provide maximum opportunities of employment to their students. He informed that the efforts were being made by Chief Minister Bhupender Singh Hooda to make Haryana an educational hub and this college should also help in making the state an educational hub. Six new courses, under self-finance scheme, had been started by the college, while four new courses would be introduced under this scheme shortly, he said. Gaur assured that the efforts would be made to get this college recognised permanently. He said the people of this region would be more benefited after the construction of an education complex on the college premises and the college would get its separate identity on its expansion as a model college in the field of education. College managing committee president Narayandutt Sharma highlighted the achievements of students in the field of education, sports and cultural activities. He also thanked those who contributed financially to the construction of the new education complex on the college premises. After inaugurating the concluding function, Dr Ram Prakash, Member of Rajya Sabha, said for the overall development of personality, such cultural programmes were helpful because they gave complete education to a human being. Dr Yogeshwer Joshi, organisation secretary of the festival, informed that over 500 students from 13 colleges of the Kurukshetra zone participated in 24 events of the festival. Principal of the college Kailsh Chand Sharma gave best wishes to the students who participated in the festival and won prizes. He assured that all necessary facilities would be provided to such students who wanted to participate in these activities. Overall Trophy: University Teaching Departments (UTD), Kurukshetra University. Group Song (General): 1. University College, Kurukshetra; and 2. UTD, Kurukshetra, and RKSD College, Kaithal. Group Dance (General): 1. RKSD College, Kaithal; and 2. UTD, Kurukshetra, and DAV College, Pehowa. Mimicry: 1. RKSD College, Kaithal; and 2. UTD, Kurukshetra. Sanskrit Drama: 1. University College, Kurukshetra; and 2. RKSD College, Kaithal, and UTD, Kurukshetra. Folk Song (Haryanavi): 1. IG Mahila Mahavidyalya, Kaithal; and 2. RKSD College, Kaithal, and Bhagwan Parshu Ram College, Kurukshetra. Haryanavi Gazal: 1. DN College, Kurukshetra; and 2. IG Mahila Mahavidyalya, Kaithal, and UTD, Kurukshetra. Orchestra (Haryanavi): 1. RKSD College, Kaithal; and 2. UTD, Kurukshetra. Folk Instrumental Solo: 1. RKSD College, Kaithal; and 2. UTD, Kurukshetra, and University College, Kurukshetra. Group Song (Haryanavi): 1. University College, Kurukshetra; and 2. UTD, Kurukshetra, and Bhagwan Parshu Ram College, Kurukshetra. Classical Vocal (Solo): 1. DN College, Kurukshetra; and 2. UTD, Kurukshetra. Classical Dance (Solo): 1. UTD, Kurukshetra. Light Vocal (Indian): 1. UTD, Kurukshetra; and 2. University College, Kurukshetra, and IG Mahila Mahavidyalya, Kaithal. 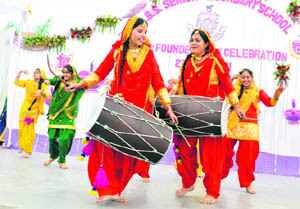 Group Dance (Haryanavi): 1. RKSD College, Kaithal; and 2. UTD, Kurukshetra, and IS Kanya Mahavidyalya, Fatehpur, Pundri. Haryanavi Pop Song: 1. RKSD College, Kaithal; and 2. UTD, Kurukshetra, and IS Kanya Mahavidyalya, Fatehpur, Pundri. Skit Haryanavi: 1. RKSD College, Kaithal; and 2. Isharjot Degree College, Dhanirampura, Pehowa, and UTD, Kurukshetra. One-Act Play: 1. Isharjot Degree College, Dhanirampura, Pehowa; and 2. UTD, Kurukshetra, and DAV College, Pehowa. Mime: 1. UTD, Kurukshetra; and 2. Bhagwan Parshu Ram College, Kurukshetra, and RKSD College, Kaithal. Classical Instrumental Solo (Percussion): 1. UTD, Kurukshetra. Classical Instrumental Solo (Non Percussion): 1. UTD, Kurukshetra; and 2. Jai Ram Girls College, Lohar Majra, and IS Kanya Mahavidyalya, Fatehpur, Pundri. Folk Song (General): 1. University College, Kurukshetra; and 2. DN College, Kurukshetra, IG Mahila Mahavidyalya, Kaithal, and I.S. Kanya Mahavidyalya, Fatehpur, Pundri. Western Instrumental (Solo): 1. RKSD College, Kaithal; and 2. UTD, Kurukshetra, and University College, Kurukshetra. Western Group Song: 1. UTD, Kurukshetra; and 2. IG Mahila Mahavidyalya, Kaithal, and University College, Kurukshetra. Western Vocal (Solo): 1. University College, Kurukshetra; and 2. IG Mahila Mahavidyalya, Kaithal, and RKSD College, Kaithal. Saang: 1. RKSD College, Kaithal; and 2. UTD, Kurukshetra. Haryanavi Dance Male (Solo): 1. UTD, Kurukshetra; and 2. RKSD College, Kaithal, and Jat College, Kaithal. Haryanavi Dance Female (Solo): 1. IS Kanya Mahavidyalya, Fatehpur, Pundri; and 2. UTD, Kurukshetra, and Isharjot Degree College, Dhanirampura, Pehowa. Choreography: 1. Bhagwan Parshu Ram College, Kurukshetra; and 2. DAV College, Pehowa, and University College, Kurukshetra. In a statement issued here recently to mark World Stroke Day, Dr Gupta said stroke referred to a group of disorders which resulted due to abnormality in blood supply to the brain as most of the stroke had been due to sudden decrease in blood supply to brain that could result in paralysis. “Stroke is the third leading cause of death worldwide and the survivors are left with devastating disabilities which leave them incapable of working or to have a normal lifestyle,” he said. He said because of the changing lifestyles, including urbanisation, smoking, salt/alcohol intake, stress and increased life expectancy, incidences of stroke had become common in the country and states like Haryana and Punjab had been no exception. He said stroke was the third most common cause of death and disability and according to a WHO survey done in 1990, out of 9.4 million deaths in India, 6, 19,000 were due to stroke. It has been estimated that approximately 20 to 30 per cent of stroke may be caused by stenosis of carotid artery. He said most of the strokes, approximately 75 per cent, were ischemic (due to blockage of blood supply) in nature and large vessel disease accounts for approximately 40 per cent of ischemic stroke. Dr Gupta said: “When the narrowing of vessel goes beyond a degree, the patient has a high risk of stroke despite medication”. Surgical revascularisation was not possible in intracranial arteries and angioplasty or stenting was the option available for recanalisation, he added. “Neurovascular intervention or interventional neuroradiology was a branch in which minimally invasive procedures of cerebrovascular disorders are performed,” Dr KS Lallar, senior cardiologist, PGIMS, Rohtak, said. This minimally invasive approach ensured minimal injury to normal brain, with less complications, better outcome and shorter hospital stay, he added. While a number of youths were honoured for their brilliant performance in sports, academics and other spheres, Avtar Singh Bhadana announced a reward of Rs 10 lakh for Sunita Singh Gujjar (26) of Rewari district, who unfurled the Tricolour at the Mount Everest, recently. Showering accolades on Sunita for her spectacular achievement, Bhadana asserted that by scaling the Mount Everest, she had won laurels for the Rewari region as well as the state. Further stating that while her peerless achievement had catapulted the Gujjar community on a lofty pedestal of recognition, he said such talented youths alone could usher the country in a new era of holistic ascendancy. Bhadana went on to say that Congress' youth icon Rahul Gandhi too was guiding and encouraging youths to come forward for a radical transformation of the country. While Power, Forest and Environment Minister Capt Ajay Singh Yadav was the chief guest, a prominent social activist Gopi Chand Bagotia presided over its proceedings. The function commenced with the lighting of a lamp and offering of floral tributes before a portrait of Dr Ambedkar by the chief guest and others. Simultaneously, mentioning about the Indira Priyadarshini Shagun Yojna, Indira Gandhi Drinking Water Scheme, Mahatma Gandhi Residential Scheme and other such projects, Capt Yadav asserted that the state government was paying special attention to the welfare of the Scheduled Castes and other underprivileged sections of society. While the minister announced a financial assistance of Rs 1 lakh out of his discretionary fund for the association, a book on the life and teachings of Dr Ambedkar, authored by RS Sambhariya, chairman of the association, was also released by him. As many as 205 meritorious SC students, who won distinctions in matriculation, senior secondary and other professional examinations this year, were also honoured on the occasion. Besides, RS Sambhariya and association functionary Ram Niwas Dahiya also addressed the gathering. The meeting was called against the backdrop of the Kasni village incident wherein a woman, along with her armed-accomplices, allegedly opened fire at her mother-in-law and brother-in-law from a close range after barging into their house in broad daylight at the village recently following some family dispute. Addressing the meeting, the IGP said rising incidents of crime in the district were the indication that there was some lapse on the part of the police following which it has not been successful in checking crime despite making all efforts. Kamaraja also sought reply from Jhajjar Police Chief Patram Singh regarding the strategy to arrest the accused of Dulhera killing case wherein four youths, including the son of a former sarpanch, were gunned down by a group of assailants near the bus stop in Dulhera village here on August 3 last when they were coming back to Bahadurgarh after deposing before a court in Jhajjar City. Thought the police had registered a case of murder against eight persons in this regard, it failed to arrest any of them. The IGP listened to the views of the district police officers about bringing improvement in their functioning and also directed them to strengthen their information system and keep in touch with informers, besides installing ‘nakas’ at all sensitive points of their area concerned for the checking of vehicles. “Timely information is much essential for the police not only to curb any sort of crime before its occurrence but also to apprehend the criminals. Hence, the police officers must spend ample time to acquire vital information from their sources about the controversial issues and disputes of their area concerned, besides keeping a tab on all those people who have indulged in any criminal activities in the past,” said Kamaraja. He directed the police officers to make special efforts for the successful operation of the SMS service being provided by the Rohtak Range Police at Rohtak, Jhajjar, Sonepat and Panipat districts for gathering vital information about the crime from the public. Mitesh Jain, SP, Yamunanagar, inaugurated the 34th Zonal Youth Festival by lighting the lamp here recently in the auditorium of Hindu Girls College, Jagadhari. Dr Ujjwal Sharma, principal of the college, welcomed the chief guest. The chief guest in his inaugural address congratulated the college team for organising the festival with zeal. He said the students should think beyond victory and defeat and exhorted them to work hard with dedication. President of the managing committee Dalip Chand, vice-president of the committee Rakesh Gulati, general secretary Parmod Garg and treasurer Yash Pal were also present on the occasion. Classical Dance (solo): Kashni Chopra from DAV College, Yamunanagar (recommended). Group Dance: MLN College, Yamunanagar (recommended), GN Khalsa College, (commended) and DAV College, Yamunanagar (commended). Haryanvi Group Song: DAV College, Yamunanagar (recommended), MLN College, Yamunanagar (commended) and Hindu Girls College, Jagadhri (commended). Group Song (general): DAV College, Yamunanagar (recommended), MLN College, Yamunanagar (commended) and DAV College, Sadhaura (commended). Classical Vocal (solo): DAV College, Yamunanagar (recommended), GNG College, Yamunanagar (commended) and GN Khalsa College, Yamunanagar (commended). Classical Instrumental (solo): GNG College, Yamunanagar (recommended), Hindu Girls College, Jagadhri (commended) and DAV College, Yamunanagar (commended). Classical Instrumental (solo): MLN College, Yamunanagar (recommended) and GN Khalsa College (commended). Stating this here recently, Dr Dixit Garg, prof in charge of the Public Relations Department, NIT, said Bansal had retired from NIT, Kurukshetra, on February 2011 after serving the institute for more than 30 years. Dr Garg said the research paper was awarded the Best Paper Award by the Indian Society for Rock Mechanics and Tunnelling Technology under the category of Rock Testing and Monitoring of Rock Structures for 2006. The award was received by the authors at an inaugural ceremony of INDOROCK - 2011 held at IIT-Roorkee. Dr Dalip K Gosain, head of the Krishi Vigyan Kendra (KVK), cautioned the farmers against using seeds kept from the previous year’s crop without seed treatment and said it deprived the farmers of the higher wheat production. 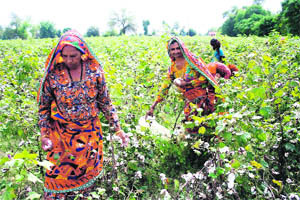 Addressing 130 farmers, including 35 farm women from Sabarkantha district of Gujarat, Udaipur of Rajasthan, Karnal, Kaithal and Panipat from Haryana and five districts of Jharkhand, Gosain said in a recent survey conducted by him covering more than 1,000 farmers and farm women from Haryana, western and eastern UP, Bihar and Jharkhand revealed that a majority of the farmers used the wheat seeds kept at their home from the previous crop which affected the production. The survey revealed that in Haryana, wheat seeds rate per acre, when used from the previous year wheat crop, was 55 kg per acre while in western UP it was around 60 kg per acre compared to 70-80 kg per acre in eastern UP and Bihar and around 90 kg per acre in Jharkhand, which was strikingly high. Gosain said in majority of the recommended timely sown varieties, the seed rate was 40 kg per acre while in case of little delayed sowing, it could be 45 kg per acre. He said the high wheat seed rate caused losses to the farmers and ideal rate was 20 kg per acre while the permissible rate was 40 kg per acre. He added that the prices of the subsidised processed wheat seeds were almost on a par with that sold by the government agencies and, therefore, the farmers should use the certified seeds for higher wheat production. Gosain said the farmers of Haryana, Punjab and Western Uttar Pradesh should take utmost care in selecting the varieties after consulting experts and grow HD-2894, PBW-550, DBW-17,WH-711 and recently-released wheat varieties of HD-2967 and PBW-621. The farmers of eastern UP, Bihar and Jharkhand may use HD-2733, HD-2824 and CBW-38 while farmers of MP, Chhattisgarh, Gujarat, Kota and Udaipur may use HD-2932, HD-2864, GW-366 and GW-322. Dr NK Nagpal, principal of the college, gave away prizes to the winners and encouraged them to participate in co-curricular activities. This was stated by Sahil Mohinder, a corporate trainer, while addressing the students at a seminar on “Preparing Manpower: Challenges to the Educational Institutions” at Maharaja Agrasen College, Jagadhri, recently. He said there were plenty of jobs in the market, but also shortage of employable manpower. to deliver in a job and human qualities to adjust in a challenging environment,” the corporate trainer added. Speaking on the occasion, Dr PK Bajpai, principal, Maharaja Agrasen College, Jagadhri, laid stress on motivation and leadership. Quoting the example of McGregor, he said nowadays both positive encouragement and critical monitoring go together in form of theory ‘Z’. Referring to Maslow’s need hierarchy, he said these days self-esteem superseded the physical, security and relation- ship needs. He called upon the participants through the example of Anna Hazare’s movement against corruption where youth participated in a large number mainly because of a higher motive to make India corruption free. He said the same was true to youth movements in Egypt, Yemen and Libya, where youth staked their lives for positive change and democratic leadership. Dr RS Wadhawan, academic coordinator, said complacency should be replaced with dynamism and a forward attitude for change. Kritika Chhatwal proposed the vote of thanks. Prof SC Dhingra, Dr ML Singla, Ruby Tyagi and Neelam were also present on the occasion. The objective of the mission is to increase the enrolment of voters so as to make the universal adult franchise a complete reality and thereby, enhance the quality of democracy. Speaking at the occasion, Dr Varinder Gandhi, principal of the college, encouraged the students to participate in the process of democracy by enrolling themselves in the electoral voter list. “Indians have attained the Right to Vote to elect their representatives after a long struggle and sacrifice. So it is our moral duty to protect ingredients of democracy,” she said. The Election Commission (EC) is making all efforts to enrol the maximum number of voters, especially those who have turned 18. As part of the campaign, the EC has asked various universities to fuel its drive in colleges and enrol students. The EC has asked the students to get their voter identity cards and register themselves before November 1 to be able to vote in the election. “This is for the first time that the EC has roped in colleges to get first-time voters,” sources said. 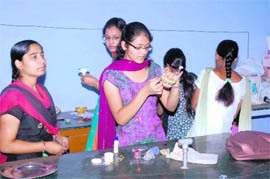 As many as 34 students of various disciplines of the college participated in the competition. The jury comprising Dr Sudesh Chopra and Dr Nirupma Saini adjudged Ashu Tyagi, Arti and Akanksha as the winners in the poster-making competition, while Palak Verma, Nishu Chaudhry and Neha won prizes in slogan-writing contest.